The second my kids get home from school I smother them with approximately 375 kisses. Then I bombard them with approximately 375 questions about their day: what did they learn, what did they eat, did they miss me–you know, the usual. Finally, I go through their bookbags because I love seeing their artwork and their worksheets from the day. However, there is one thing that comes home and can strike fear into every single parent: the dreaded letter! When I get “the dreaded letter” my first instinct is pretty rational: burn down the house…burn it all. But the good news is we can all put down our torches because if our kiddos do bring home more than just a few math worksheets from school, we can tackle and get rid of lice with a little help from over the counter products. According to the CDC, there are about 6-12 million cases of head lice each year in this country and it’s most common with preschool and elementary school aged kids. That’s a lot of bugs! Cleanliness actually has nothing to do with getting lice–so ignore that old wives’ tale. In fact, lice tends to favor a clean scalp. The very first time kids get infested they sometimes don’t get irritated. So there is no itching! This can go on for a few weeks, and when you do figure it out your child has lice, there are whole lotta lice. According to the American Academy of Pediatrics: Head lice are tiny insects, about the size of a sesame seed (2–3 mm long). Their bodies are usually pale and gray. Head lice feed on tiny amounts of blood from the scalp and if they’re not on a person’s scalp, they can usually only survive about a day. Head lice live about 28 days. They can multiply quickly, laying up to 10 eggs a day. It only takes about 12 days for newly hatched eggs to reach adulthood. This cycle can repeat itself every 3 weeks if head lice are left untreated. Now we know more about these pesky bugs, let’s find out how to get rid of them if they take up residency in our kid’s heads–note: burning down your house is not on this list. The FDA has approved over-the-counter lice products as safe and effective when used according to the Drug Facts label instructions. Ingredients like Permethrin or Piperonyl Butoxide and Pyrethrum Extract are key to successful killing the lice. 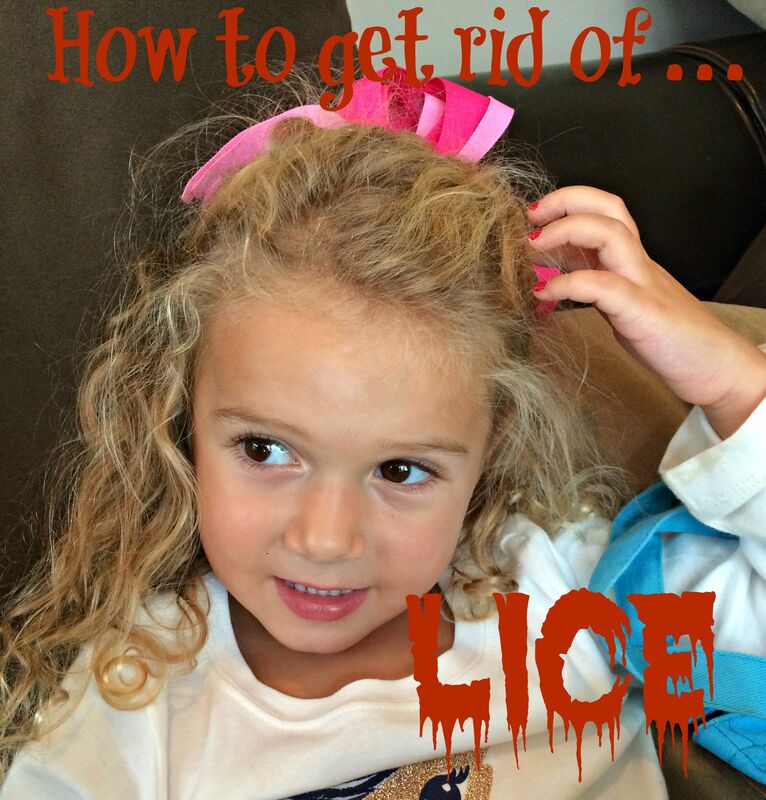 If you’ve followed the directions and treated the lice with OTC treatments two or more times and STILL have lice, talk to your pediatrician and your child’s school to create a plan to get rid of the lice. Stay strong, parents. We can fight lice. Lice doesn’t have to win. Lice doesn’t have to creep you out–OK, actually does. Lice will always creep me out because *scratches head* it’s lice after all. I would DIE if my kids ever got lice. It’s seriously my worst nightmare. My mom wold have to come stay with me if it ever happens because I just can’t. This is great information. My son never had an issue with lice. When he was is school he always had a crew cut. My kids were unfortunate enough to get lice once in elementary school. It was a pain to get rid of them! I was totally scratching my head after I began reading this article…and realized it when you said try not to scratch! My sons just started daycare and preschool, and thankfully we have not dealt with head lice yet. We are just battling congestion that won’t quit! Thank you so much for sharing this! Lice give me the heebies and the jeebies. Just thinking about them gives me the creepy crawlies. This is super helpful. My kids were able to make it through school without it but there were a number or lice warnings issued by the school administration! Awww Lice. As a teacher I always hated to call parents about lice. Its such a frustrating thing to go through. Lice freaks me right out. We take precautions to make sure we don’t get it and haven’t yet… knock on wood. All 6 kids have been lice free! I remember how hard it was to fight lice when the kids were younger. They hated to sit while i pulled out nits. There are so many great products out there to help. Just the mention of the word has me itching. This is one of those “you hope you don’t ever need this information” kind of things. I’m in the I hope I never have to deal with it again stage! Ugh! We have already gotten one of those letters this year. I use an essential oil prevention spray. It’s worked so far. Fingers crossed! As a former Special Education Teacher I would be alert on ‘lice prevention’ shampoos and sprays so I wouldn’t pick it up from the kids, those things creep me out! I do not have children, but if I did I would have to inspect their scalp everyday before they walked in the door! Ewe! The idea of lice really creeps me out. Stocking up on shampoo sounds like a good idea. My daughter had thick and long hair in grade school and got lice. It literally took us months to get rid of them. It was a huge nightmare. I hate head lice! It makes me itch just thinking about it! This is a great post.